The Hyattstown Mill Arts Project is located in historic Hyattstown, Maryland, northwest of Washington, DC. It is a membership-based non-profit cultural arts organization dedicated to preserving the cultural heritage of the region and is part of a close working partnership involving the Montgomery County Government, Little Bennett Regional Park and the Maryland National Capital Park and Planning Commission. 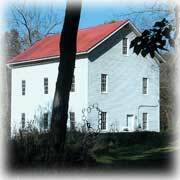 The organization operates out of the historic Hyatttstown Mill and nearby Miller's House in Montgomery County's Little Bennett Regional Park.The Mill, Miller's House and surrounding grounds occupy 2.5 acres along Hyattstown Mill Road which leads to park trails and other historic sites>. Hyattstown Mill Road intersects Maryland State Route 355, also know as Frederick Road, in Hyattstown. HMAP sponsors a variety of events and activities throughout the year. Art exhibitions, literary and musical events and classes are held in the mill or in the Miller's House. Exhibitions are scheduled approximately monthly from April through October and are open to the public on weekends. Invitations are posted on this web site, advertised on flyers, and distributed by e-mail. All HMAP activities, and events are open to the public. 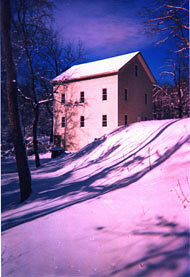 Mill In Winter, Digital photograph by Mike Shaffer. The image was made from an original photograph from HMAP files taken in 2001. The Mill, located in Little Bennett Regional Park, is in one of Montgomery County's oldest historic sites.